Interstate 26 runs northerly from Charleston, South Carolina to a point just south of the Tennessee-Virginia State line near Kingsport. 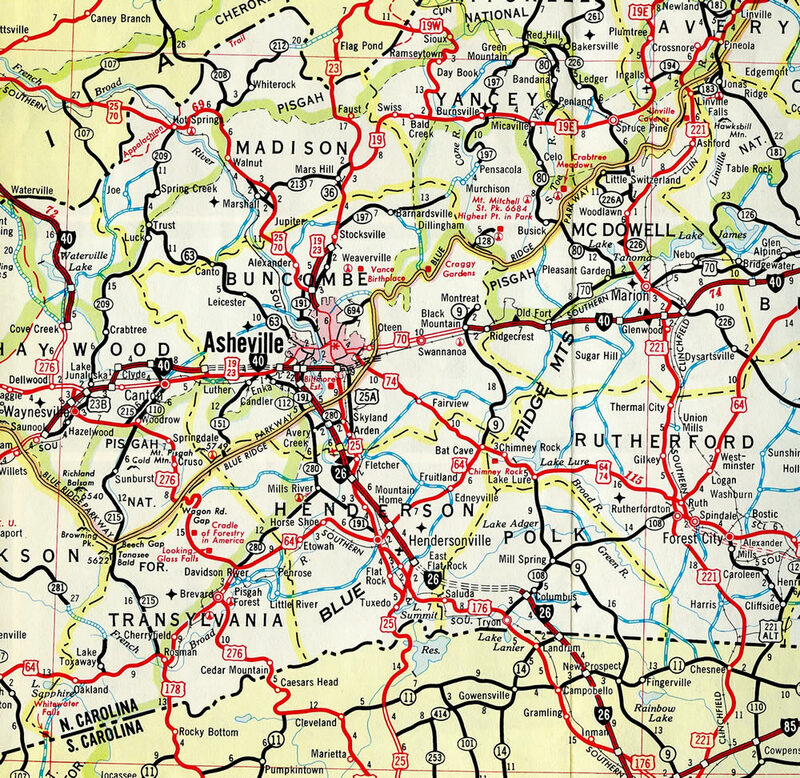 The route was twice extended from the original western terminus at Asheville, North Carolina, first in 2003 to I-81 and again in 2005 to U.S. 11W. Interstate 26 begins in the Tri-Cities Region of Tennessee at U.S. 11W (West Stone Drive), which was the historic northern terminus of Interstate 181. I-26 overtook all of I-181 from Kingsport southward to Johnson City, and U.S. 23 from there to the North Carolina state line. This stretch includes a winding urban section through Johnson City, where U.S. 19W ties in from the northeast. Angling southwest, I-26 & U.S. 19W-23 travel through a valley between the Buffalo and Little Mountains to Erwin. Beyond there, the freeway climbs in elevation from south of Rich Mountain along the 2003-opened alignment, to the Bald Mountains and Sams Gap across the state line. Advancing southward, I-26 lowers through the Walnut Mountains to join an older stretch of freeway near Mars Hill. U.S. 19 ties in from Radford Gap, joining I-26 & U.S. 23 between Flat Creek and Weaverville, where U.S. 25 & 70 merge on from the northwest. The five-way overlap concludes near Downtown Asheville, with U.S. 25 & 70 departing for Interstate 240 east and U.S. 19 & 23 parting ways beyond the French Broad River (Bowen Bridge) to western reaches of the city. Interstates 26 & 240 combine for 4.2 miles through West Asheville to meet Interstate 40 near Sand Hill. The exchange with I-40 was the original western terminus of I-26. South from there, I-26 travels an older freeway to Hendersonville and the Blue Ridge Mountains, with U.S. 25 rejoining the freeway between Fletcher and East Flat Rock. Beyond the split with U.S. 25 south, I-26 spans the Green River along the Peter Guice Memorial Bridge at a height of 225 feet. The freeway then winds eastward to Howard Gap and Columbus before making its final approach to the Palmetto State at Landrum. Interstate 26 follows a southeasterly path throughout South Carolina. 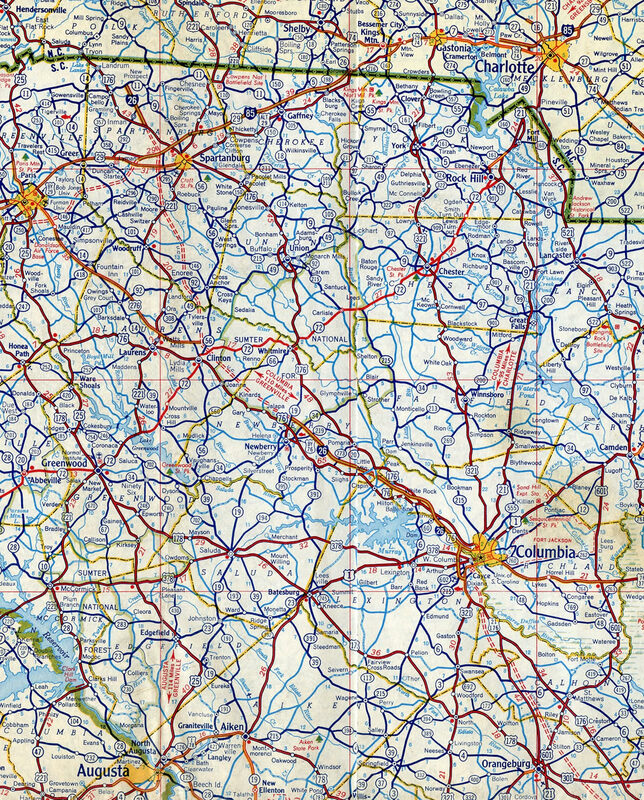 The freeway initially straddles western reaches of the Spartanburg area through the Upstate. South from there, I-26 combines with the end of I-385 from Greenville to traverse Sumter National Forest on the drive to Columbia. Within the capital city area, I-26 expands to six lanes to the “Malfunction Junction” cloverleaf interchange with I-20. Interstate 126 spurs east from nearby to Downtown Columbia while I-26 stays to the west by Cayce and Columbia Metropolitan Airport (CAE). Continuing southeast, Interstate 26 next meets the Orangeburg area before crossing paths with I-95 at a rural cloverleaf interchange. Pine forest gives way to suburbia as the route passes by Summerville en route to Goose Creek, North Charleston and the junction with Interstate 526. The final stretch winds I-26 through urban settings to U.S. 17 just north of Downtown Charleston. Built in 1968, the 1,315 foot long Smoky Park Bridges carry eight overall lanes of traffic, with auxiliary lanes running in each direction between Westgate Parkway / Patton Avenue and the Downtown interchange. The substandard bridges have no shoulders. Photo taken August 23, 2003. The I-26 Connector involves three separate segments: Section A involves upgrading 4.3 miles of Interstates 26 & 240 from the junction with I-40 to the Patton Avenue interchange, west of the French Broad River. Section B includes improvements to the interchange between Interstates 26-40-240 and the adjacent Brevard Road (NC 191) exit on I-40. Section C entails the construction of a new 2.6 alignment and bridge across the French Broad River for I-26 between the Patton Avenue interchange and the Future I-26 / U.S. 19-23-70 freeway south of Broadway Street. The Interstate 26 Connector Project was delayed in April 2005 with the release of the state comprehensive transportation plan. This plan pushed the completion date of the Interstate 26 Connector Project back to 2012.6 Subsequent delays followed, further setting back the connector start date to 2024. The Route Log and Finders List retains the mileage for I-181 in Tennessee. NC official mileage omits the segment of Future I-26. 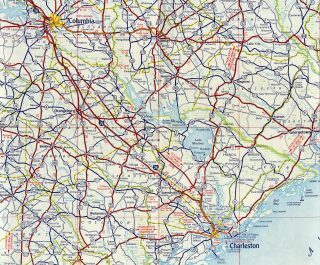 Significant portions of Interstate 26 were already under construction throughout South Carolina by 1960. Interstate 26 was open between Exit 115 (U.S. 21-176-321) and Exit 72 (S.C. 121 / old S.C. 19) and from Exit 15 (U.S. 176) to Exit 5 (S.C. 11) by 1960. Interstate 26 was fully open in the Palmetto State between U.S. 15 (Exit 172) and South Carolina 14 (Exit 1) by 1962. 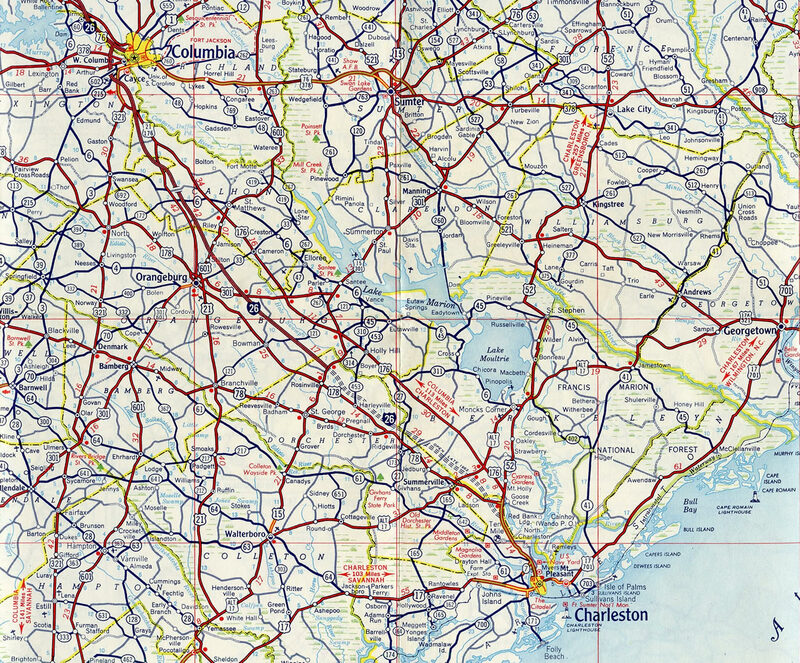 A 37-mile stretch of Interstate 26 opened to traffic in South Carolina’s Low Country by late 1962. This extended the route southeast from U.S. 15 to U.S. 52 & 78 near North Charleston. The majority of Interstate 26 was completed in the Tar Heel State by 1970. 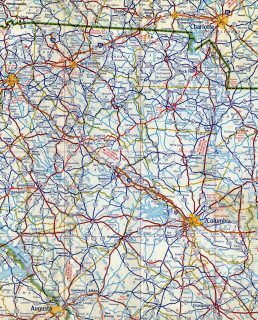 The exception was the east-west portion between East Flat Rock and Columbus – 1970 North Carolina Official Highway Map. An in depth look at all the alternatives for the I-26 Connector Project, including several options for the French Broad River crossing and exchange with I-240. 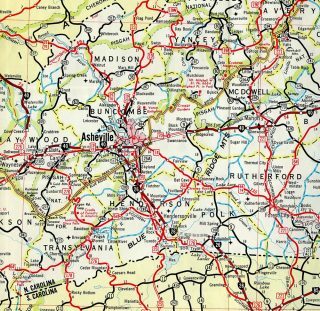 It was anticipated that in addition to providing a new truck route to I-81, that the extended Interstate 26 would enhance local economies of the counties between Asheville and the Tri-Cities Region of Tennessee. Projections initially forecast a tripling of the traffic count at the state line by the year 2010, with up to 16,000 vehicles per day (vpd) predicted. TDOT traffic counts in 2014 however totaled just 7,430 vpd, down from 8,774 vpd recorded in 2010. 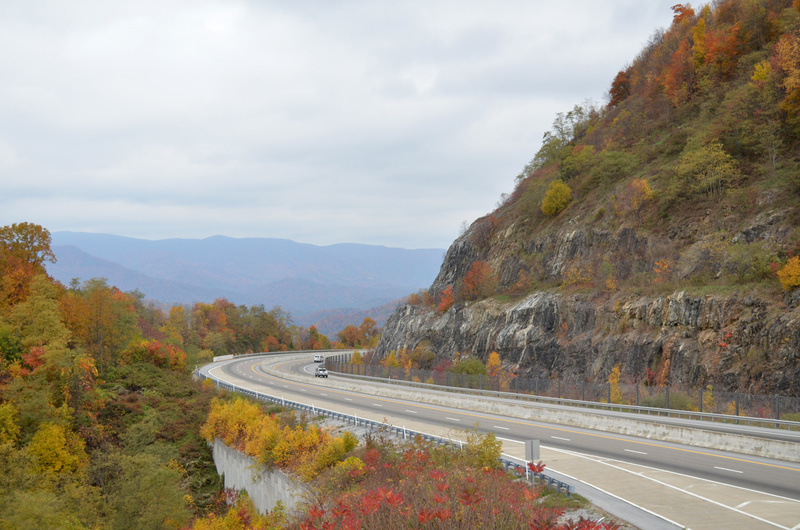 The Sams Gap Scenic Overlook along Interstate 26 during peak fall foliage season. The freeway winds north toward Little and Flint Mountains in this scene. Photo taken October 25, 2015. Eastbound Interstate 26 approaches the Lucille S. Whipper Interchange (Exit 220) with U.S. 17 north and the Arthur Ravenel, Jr. Bridge its end at U.S. 17. Photo taken by Jeff Morrison (08/10/05). Exit 219B lowers from the Interstate 26 viaduct to Mt. Pleasant Street for King Street (U.S. 78), Meeting Street (U.S. 52) and Morrison Drive (unsigned U.S. 52 Spur). I-26 merges with U.S. 17 south next. Photo taken by Jeff Morrison (08/10/05). U.S. 17 south stays elevated adjacent to the ending Interstate 26 east as Exits 221A and 221B separate. The freeway mainline defaults onto Meeting Street (U.S. 52 north) for the Charleston historic district while a flyover veers west to merge with Septima Clark Parkway west toward Downtown. Photo taken by Jeff Morrison (08/10/05). A high flyover shuttles drivers onto U.S. 17 and the Ravenel Bridge east to Mount Pleasant as three lanes advance southward along I-26 toward Downtown Charleston. Photo taken by Jeff Morrison (08/10/05). The end sign for Interstate 26 posted at Exit 219B was carbon copied onto a new sign bridge posted for the pending exchange with U.S. 17 and the Arthur Ravenel, Jr. Bridge. Photo taken by Chris Patriarca (06/08/03). Prior to construction of the high speed exchange with the Ravenel Bridge, Interstate 26 east continued uninterrupted to a directional T interchange with the Septima Clark Expressway (U.S. 17 between Downtown and the original Grace and Pearman Bridges). Photo taken by Chris Patriarca (06/08/03). Interstate 26 east ended as two-lane ramps partitioned for U.S. 17 (Septima Clark Expressway) south. Adjacent ramps connected with King Street (U.S. 78 north) and Meeting Street (U.S. 52 north). Both ramps remain in use, though Exit 221B serves Meeting Street only as Septima Clark Expressway east was dismantled along with Silas Pearman Bridge east across the Cooper River. Photo taken by Chris Curley (03/14/01). Pier supports for the eventual U.S. 17 southbound mainline to Septima Clark Parkway were in place as construction progressed on the Ravenel Bridge. Photo taken by Chris Patriarca (06/08/03). The previous ramp split of Exit 221B for U.S. 17 north to Mount Pleasant, and Meeting Street south to the Charleston historic district. U.S. 17 formerly traveled along a viaduct system from west of I-26 to the Pearman and Grace Bridges. Photo taken by Chris Patriarca (06/08/03). Exit 221A connected the east end of I-26 with King Street and the unmarked eastern terminus of U.S. 78.This ramp is no longer accessible to Interstate 26, but remains in place for motorists taking U.S. 17 south from the Ravenel Bridge. Photo taken by Chris Patriarca (06/08/03). U.S. 17 crosses the Ashley River on a 1960s-built draw bridge to an off-ramp for Bee Street and Lockwood Drive to Downtown Charleston. A pair of overpasses elevate the US highway above Lockwood Drive to the couplet with Cannon and Spring Streets. Photo taken by Chris Patriarca (06/12/03). U.S. 17 turns off Cannon Street onto Septima Clark Parkway at the Dr. Martin Luther King, Jr. Memorial District. Septima Clark Parkway takes the US route northeast to Interstate 26 west at Corning Street. Photo taken by Chris Patriarca (06/12/03). Older guide signs were retained along U.S. 17 north ahead of Coming Street and the westbound beginning of Interstate 26. A greenout and exit tab were added to the U.S. 17 northbound overhead as the US highway combines with I-26 west to Exit 220B and the Ravenel Bridge. Photo taken 11/12/16. U.S. 17 (Septima Clark Parkway) transitions to Interstate 26 west along a flyover elevating east from Coming Street. There is no direct access to King Street (U.S. 78 west) or Meeting Street as the freeway turns north to the Ravenel Bridge. Photo taken 05/30/07. A set of span wire signs at the Ashley River were the first to reference Interstate 26 along U.S. 17 north. These were removed by 2007. Photo taken by Chris Patriarca (06/12/03). A set of faded trailblazers on a pedestrian bridge above U.S. 17 north remained from the original directional T interchange with Interstate 26 west. These were finally removed by 2013 during a street scaping project to add palmetto trees and rebuild the sidewalk along Septima Clark Parkway. Photo taken 11/12/06. The roadways of U.S. 17 separated ahead of the Septima Clark Expressway intersection with Coming Street. A left-hand ramp followed for I-26 west as U.S. 17 transitioned onto a viaduct system. Photo taken by Chris Patriarca (06/08/03). The former separation of Interstate 26 west from U.S. 17 north. The viaduct looking U.S. 17 east to the Grace and Pearman Bridges was subsequently dismantled following the July 15, 2005 opening of the Arthur Ravenel, Jr. Bridge. Photo taken by Chris Patriarca (06/08/03). U.S. 17 crosses the Cooper River via the Arthur Ravenel, Jr. Bridge. This eight-lane, cable stay bridge connects Mount Pleasant with Downtown Charleston, where Interstate 26 ends. Photo taken 05/30/07. A pair of diagrammatic signs along the Ravenel Bridge westbound outline movements for succession of ramps for Meeting Street (U.S. 52), Interstate 26 west and the continuation of U.S. 17 south to Downtown. Photo taken 05/30/07. Departing first is the Morrison Drive / Bay Street off-ramp to the Port Terminals and the Aquarium of South Carolina. Collectively the two streets represent unsigned U.S. 52 Spur, which leads south to the historic Charleston Battery. Photo taken 05/30/07. U.S. 17 turns south beyond the ramp for Meeting Street (U.S. 52) onto a flyover leading to Septima Clark Parkway. This alignment stays independent of the easternmost extent of I-26, which merges with U.S. 17 at Coming Street. A single lane flyover otherwise connects with Interstate 26 as it heads northwest to North Charleston and Columbia. Photo taken 05/30/07. U.S. 17 lowered from the John C. Grace Bridge to grade level briefly before elevating again above Meeting Street (U.S. 52 north), I-26 and a Norfolk Southern Railroad line. A southbound off-ramp departed for Meeting Street prior to the exchange with Interstate 26 west. Photo taken by Chris Patriarca (06/10/03). The original ramp from U.S. 17 (Septima Clark Expressway) south to I-26 west departed from above Meeting Street. Prior signs referenced U.S. 52 and 78 for I-26 west. The two US highways parallel the freeway through North Charleston. Photo taken by Chris Patriarca (06/10/03). Meeting Street north neared the interchange complex with I-26 west and U.S. 17. Span wire supported signs once directed motorists to ramps joining Septima Clark Expressway east to Mount Pleasant and I-26 west to North Charleston. This was also the first reference for the northbound beginning of U.S. 52. Photo taken by Chris Patriarca (06/13/03). The northbound ramp for U.S. 17 passed under the Septima Clark Expressway viaduct before joining the left-hand side of the Silas Pearman Bridge. A left-turn restriction at forthcoming Lee Street required drivers on Meeting Street north to make a jug handle type movement to access I-26 west. Photo taken by Chris Patriarca (06/13/03). Motorists turned left from the ending U.S. 52 south to access U.S. 17 north to Mount Pleasant from the same ramp. Photo taken by Chris Patriarca (06/13/03). The Meeting Street ramp split into a direct connection to U.S. 17 north and a U-turn ramp for Lee Street west to its ramp for Interstate 26 west. Photo taken by Chris Patriarca (06/13/03). Lee Street west defaulted onto the westbound beginning of Interstate 26 from Meeting Street (U.S. 52). Photo taken by Chris Patriarca (06/13/03). The Lee Street on-ramp combined with ramps from U.S. 17 (Septima Clark Expressway) as Interstate 26 started. This surface level ramp was demolished, with motorists now directed north on Meeting Street (U.S. 52) to a new ramp beside the Ravenel Bridge. Photo taken by Chris Patriarca (06/13/03). The first confirming marker for Interstate 26 west appears after the split with U.S. 17 north and four miles ahead of North Charleston. The capital city of Columbia lies 111 miles to the northwest. Photo taken 05/30/07. Interstate 26 west & U.S. 23 south drop over 300 feet in elevation from Holston River Mountain to span the South Fork of the Holston River. A lengthy viaduct takes motorists north to U.S. 11W (West Stone Drive). Photo taken 10/02/10. Traffic to U.S. 11W (West Stone Drive) departs from I-26 west. U.S. 11W constitutes an east-west arterial across the north side of Kingsport. Photo taken 10/02/10. An end shield for Interstate 26 stands just beyond the six-ramp parclo interchange with U.S. 11W. U.S. 23 solo northward to Norton, Virginia and Pikeville, Kentucky. Photo taken 05/31/07. U.S. 23 bisects suburban areas south from the Granby Road overpass as it winds southward toward U.S. 11W (West Stone Drive) and the beginning of Interstate 26 east. Photo taken 10/02/10. U.S. 23 lowers through a valley at Fort Robinson as Exit 1 departs for U.S. 11W (West Stone Drive) across north Kingsport. Holston River and Bays Mountains rise to the south. Photo taken 10/02/10. Passing over U.S. 11W (West Stone Drive), U.S. 23 south transitions into Interstate 26 as milepost zero appears. Photo taken 10/02/10. A begin Interstate 26 shield was added by 2007, but modified by 2009, as U.S. 23 approaches a long viaduct over the South Fork of the Holston River, Long island and Riverport Road. Photo taken 10/02/10. U.S. 11W (West Stone Drive) enters the six-ramp parclo interchange with Interstate 26 east and U.S. 23 after Union Street. Photo taken 06/25/12. U.S. 11W heads west across a residential street grid from an interchange with SR 36 to the ramps for U.S. 23 and I-26 east at Fort Robinson. Photo taken 06/25/12. Three quarters of a mile south of the Interstate 26 west & U.S. 23 north exchange with I-81 at Exits 46A/B. Photo taken by Chris Patriarca (04/03). Passing over Fordtown Road, I-26 west & U.S. 23 north approached the off-ramp (Exit 46A) for I-81 north to Bristol. There are five interchanges left along Interstate 81 north within the Volunteer State. Photo taken by Chris Patriarca (04/03). Interstate 26 entered the full cloverleaf interchange with Interstates 81 and 181. U.S. 23 continued north onto I-181 to Kingsport. Photo taken by Chris Patriarca (04/03). No formal signs were posted of the transition of Interstate 26 west into Interstate 181 north as Exit 46B looped away for I-81 south to Knoxville. Photo taken by Chris Patriarca (04/03). Interstate 181 & U.S. 23 wound southeast between Birdwell and Buckaloo Ridges on the one mile approach to Interstates 81 and 26. Photo taken by Chris Patriarca (04/03). Exit 46B joined I-181 & U.S. 23 with Interstate 81 south to Morristown and I-40 near Dandridge. Photo taken by Chris Patriarca (04/03). Exits 46B/A were renumbered to Exits 8A/B once Interstate 26 replaced I-181 entirely. Photo taken by Chris Patriarca (04/03). Interstate 181 used to continue 15 miles south from I-81 to U.S. 321 (Exit 31) in Johnson City. Photo taken by Chris Patriarca (04/03). Interstates 26 and 181 appeared first to motorists along I-81 north at the Tri-Cities Crossing off-ramp (Exit 56). Photo taken by Carter Buchanan (08/08/04). Many preexisting signs for Interstate 181 south were amended to show I-26 rather than replaced. In these instances, often an East placard meant for a stand alone shield was affixed to the guide sign as a stopgap measure. Photo taken by Carter Buchanan (08/08/04). Interstate 26 extended south from the ending I-181 along side U.S. 23 to Gray and Johnson City. Photo taken by Carter Buchanan (08/08/04). An Interstate 26 shield was added to the preexisting sign for Interstate 181 and U.S. 23 on the one-mile guide sign for Exits 57B/A on I-81 south. Photo taken 08/23/03. Exit 57B departed from Interstate 81 south for the remainder of I-181 north to Kingsport. Exit 57A followed for the initial stretch of I-26 leading south to Gray and Johnson City. Photo taken 08/23/03. An east placard was added above the newly placed shield for Interstate 26 at the loop ramp for U.S. 23 south to Johnson City. Later sign changes added Asheville, North Carolina. Photo taken 08/23/03. One half mile ahead of the Interstates 40/240 junction on I-26 west. According to AARoads contributor Carter Buchanan, Interstate 26 shields were added to guide signs along I-240 east on Saturday July 19, 2003. Photo taken by Chris Patriarca (06/19/03). Back to back off-ramps departed from the west end of Interstate 26 for I-40 east to Hickory and Statesville and I-40 west to the Great Smoky Mountains and Knoxville. The freeway mainline otherwise transitioned to Interstate 240 east to Downtown Asheville. Photo taken by Chris Patriarca (06/19/03). Travelers bound for I-40 east to Biltmore Forest, east Asheville and Morganton departed from I-26 & U.S. 74 west. A diagrammatic sign outlined the forthcoming left-hand ramp (Exit 1B) for I-40 & U.S. 74 west to Canton and the Great Smoky Mountains Expressway. Photo taken by Chris Patriarca (06/19/03). Interstate 26 west ended as Interstate 240 east commenced a 9.5 mile urban loop through Asheville. Sign changes made here initially added I-26 shields to overheads for I-240. The two share a wrong-way overlap to Downtown Asheville. Photo taken by Chris Patriarca (06/19/03). Interstates 240 and 40 converge west of the French Broad River and North Carolina 191 (Brevard Road). The area topography limited the exchange between the two and I-26 to utilize Brevard Road for movements from I-240 west to I-40 east and from I-40 west to I-240 east. Photo taken by Chris Patriarca (06/19/03). Interstate 240 west expanded to three lanes beyond N.C. 191 for the upcoming separation of Exit 1A (now Exit 31B) for I-40 west and the I-26 eastbound beginning. Photo taken by Chris Patriarca (06/19/03). Two lanes continued south from Interstate 240 west for I-26 east to Hendersonville and Spartanburg, South Carolina. The directional interchange between Interstates 26, 40, and 240 utilizes left-hand ramps in all directions. Photo taken by Chris Patriarca (06/19/03). Interstate 40 & U.S. 74 concluded a 19-mile overlap east from near Clyde at the former west end of Interstate 26. This stretch of freeway was expanded to eight lanes between 2005 and 2008. Photo taken by Jeffrey Napier (01/02). One half mile ahead of the split with U.S. 74 east for Interstate 26 east on I-40 at Sand Hill. U.S. 74 combines with I-26 for 37 miles to Columbus while the former route to Lake Lure and Rutherfordton was redesignated as U.S. 74A. Photo taken by Jeffrey Napier (01/02). Exit 46A departed from I-40 east for I-26 to Spartanburg, South Carolina just prior to a left-hand ramp for the beginning of Interstate 240 east through Asheville. This configuration will remain unchanged until Section C of the I-26 Connector Project gets underway. Photo taken by Jeffrey Napier (01/02). Interstate 40 passes through the Biltmore Estate on the approach to North Carolina 191 (Brevard Road) and the historic west end of Interstate 26 (Exit 46A). Photo taken by Jeffrey Napier (01/02). Westbound travelers crossed the French Broad River one mile ahead of the left-hand ramp (Exit 46A) for I-26 & U.S. 74 east to Spartanburg, South Carolina. Photo taken by Jeffrey Napier (01/02). A folded diamond interchange joined Interstate 40 with N.C. 191 (Brevard Road) north to I-240 and West Asheville. There is no direct access to I-240 east from I-40 west. Photo taken by Jeffrey Napier (01/02). 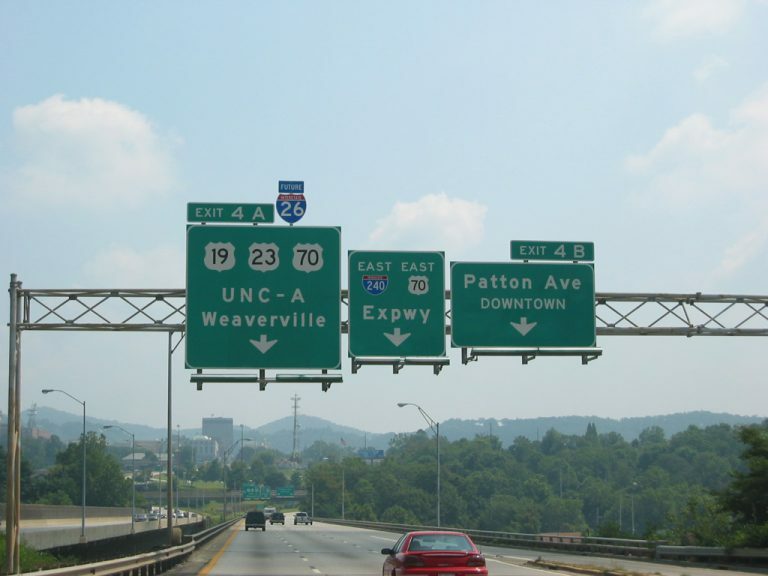 The on-ramp from N.C. 191 forms the second through lane for Interstate 40 & U.S. 74 west to Canton as the left-hand lane defaults onto Interstate 26 & U.S. 74 east to Hendersonville. Photo taken by Jeffrey Napier (01/02). “Fab road: I-26 through Smokies.” Charlotte Observer, August 5, 2003. “Extending I-26 offers new opportunity.” Bristol Herald Courier, August 3, 2003. “Highway opens to traffic.” Asheville Citizen Times, August 5, 2003. I-26 Connector, Asheville, NC. NCDOT web site. Buchanan, Carter. “Re: I-26 and 485 Photos and More at All Things NC!” Online posting, Yahoo Groups – Southeast Roads and Transport, September 14, 2003. “DOT may delay I-26 Connector project,” Asheville Citizen-Times, April 8, 2005. “Frist, Alexander, Jenkins applaud new designation of I-26.” Press Release, August 2, 2005. “State accelerates I-26 Connector work, I-40 exit.” Citizen-Times (Asheville, NC), January 11, 2016. “Nation’s Longest Interstate Route.” Herald-Journal (Spartanburg, SC), November 11, 1959. “S.C. Too Fast With Highway, Hits Dead-End.” Herald-Journal (Spartanburg, SC), November 20, 1959. “Final Stretch Of I-26 In Spartanburg County.” Herald-Journal (Spartanburg, SC), October 15, 1964. “221-Mile I-26 Longest Of State’s Freeways.” Herald-Journal (Spartanburg, SC), February 28, 1979. “Interstate 26 Will Be Reality Thursday.” Herald-Journal (Spartanburg, SC), January 11, 1967. “Local backing helped make I-26 Connector route choice.” Citizen-Times (Asheville, NC), May 19, 2016. “Connector route taking traffic off Bowen Bridge picked.” Citizen-Times (Asheville, NC), May 19, 2016.